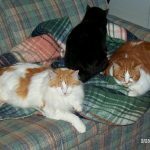 I would like to introduce you to some of my personal, domestic cat friends that I have had over the years. 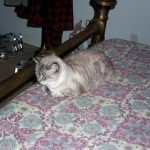 At the top of the list is my most beloved cat Zoe. She was the first fur person I ever raised. I was living in a 300 sq. ft. studio apartment at the time. In those close quarters, Zoe and I formed a bond that I cannot fully describe. Her illustration became the logo for the Zoe Foundation. 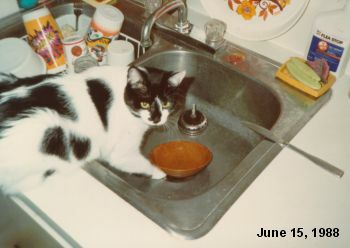 Zoe was a rambunctious bi-color, (black and white), full rumpy Manx. She weighed about sixteen pounds. She was given to me by a very close friend, Kata, who is a fine portrait artist who now specializes in Elvis Art. Zoe was born on July 28, 1987 behind a bed in a ninety year old farm house in Georgia. I located the lady who owns Zoe’s parents. 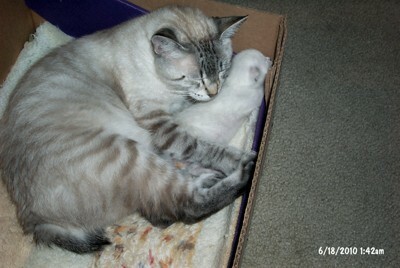 She raises Manx cats and places the kittens with families close to her home so she can visit them. Zoe is the only kitten so far who got away from the area. A friend of Kata’s brought the kitten from Georgia but did not tell the lady she was going to leave the state with her. She actually gave Zoe to Kata as a gift. Kata gave Zoe to me because the fellow she was going to marry was allergic to cats. 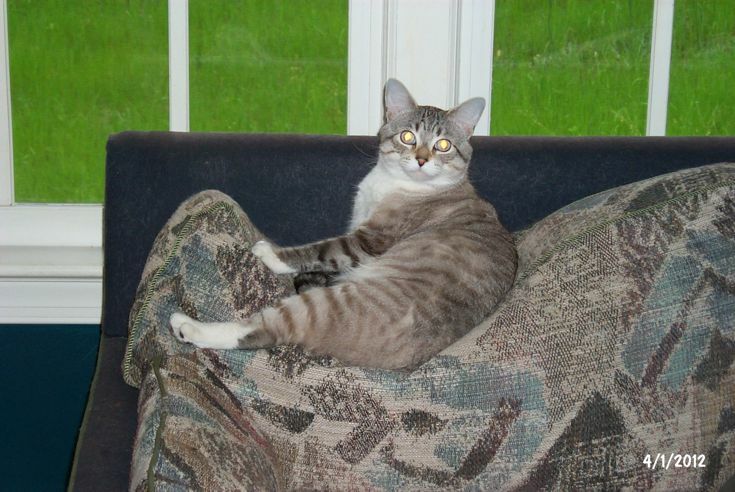 Zoe’s grandparents were two wild Manx cats that were found near where she was born. 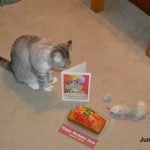 Kata named the cat Zoe after the Greek word zoe meaning ‘life in all its manifestations’. 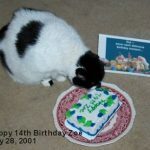 I had Zoe for nine years as an only cat. Her new roommate,Ben, was a shock to her being. Zoe was selected as the official logo for the foundation back in 1989. Her likeness (right) is now registered with the US Patent & Trademark Office. During the early life of the foundation it was not a non-profit organization. 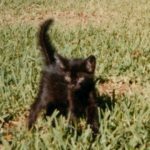 I was working to acquire funds solely through product sales, then donated a percentage of those dollars to needy animal organizations. 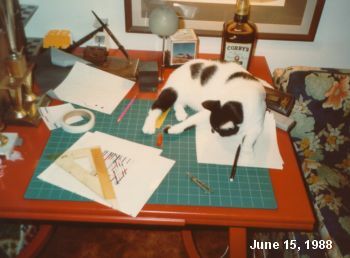 My work revolved, to a great degree, around domestic cat products. Zoe was given to me by a very close artist friend (Kata) who had already named her. Zoe in Greek means Life in all its Manifestations. I fell in love with this extremely intelligent cat and decided her illustrated form would make a fitting logo. 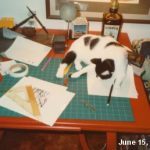 Originally it was a ‘small cats helping big cats’ direction because my sales and research efforts were directed primarily at domestic cat owners. As the years passed, and after I met Dr. Bleyman, the focus of the foundation became more targeted. We received our non-profit status and now focus on saving the tiger. But Zoe remains our logo because she’s my inspiration and has been here from the beginning. 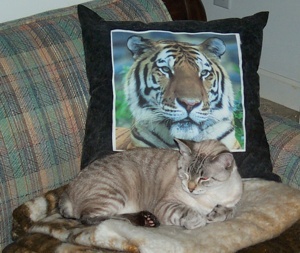 It may be a little confusing for some people to see a Manx cat as a logo for a tiger project, but as the project moves from planning to reality, her association will be solidified. 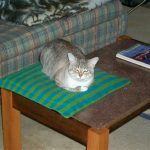 It’s still small cats helping big cats to a great degree because many domestic cat owners have a greater appreciation for the felids than do people who do not own, and maybe just don’t really understand, cats. Of course, this is not always true, but ten plus years of consumer research on this subject points to that conclusion. That’s the story of our inspiration and logo – Zoe, the world’s #1 Manx! 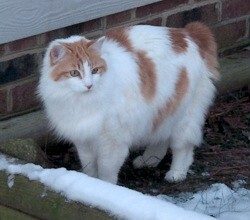 Ben is a bicolor, (orange and white), twelve pound stumpy? 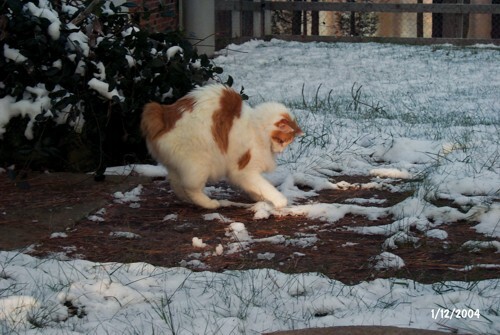 He’s a Japanese Bobtail. I met Ben while I was working on a historic home on Savage Street in downtown Charleston, SC – my home for forty years. 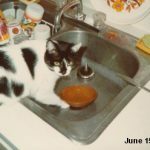 He was found shortly following hurricane Hugo and adopted by an older, retired gentleman that everyone in the area called ‘The Mayor of Savage Street’. 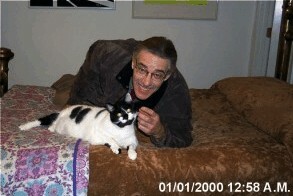 His wife told me he just loved the cat although he never really liked cats until he adopted Ben. Ben would follow him up and down the street as he walked the neighborhood greeting workers and friends. Mr. Hewitt, ‘The Mayor of Savage Street’ died suddenly one morning. When EMS came they scared Ben. He seemed lost and alone after Mr. Hewitt’s passing. Ben was wandering around a busy street, and Ann, Mr. Hewitt’s wife, was moving to a smaller home several blocks away. She decided she could not take Ben and asked the neighbors if anyone wanted him. Only one of the neighbors, who all loved to pet him, was interested. However, the woman who offered traveled extensively which meant it would have been difficult for her to keep him. That’s where I came in. I said I would love to take Ben. Mrs. Hewitt really wanted one of the neighbors to adopt him, but she decided it would be best for me to provide him with a home. I built a new fence off the back of the studio and installed cat fencing so he and Zoe could not wander. I installed two cat doors so they could go in and out when they wanted. 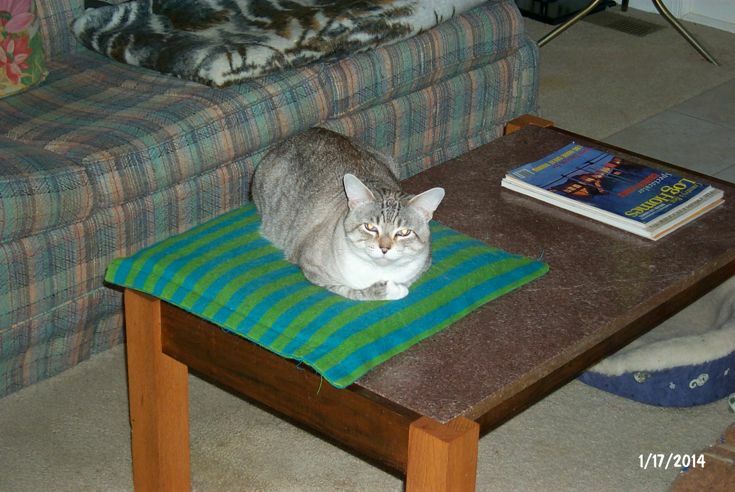 Zoe had been an indoor cat all her life, so when she got out it was a new and wonderful experience. 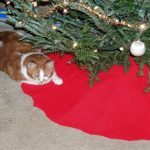 Ben was a very gentle, playful cat. 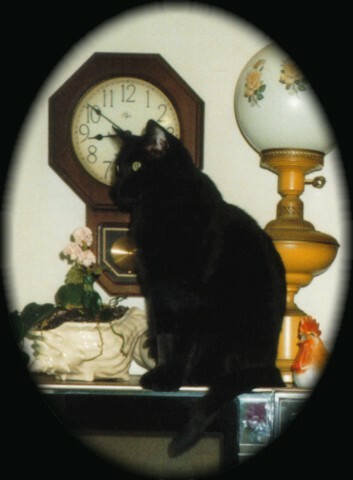 August 1, 1988 – December 19, 2009 I can’t say enough about a beautiful, wonderful cat. 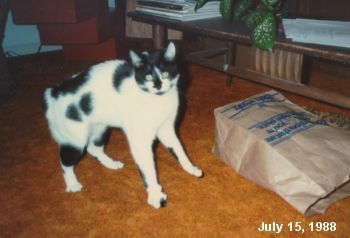 Ben was a bi-color, Japanese Bobtail. 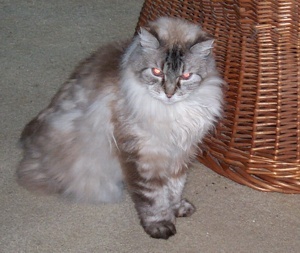 I took him home in 1994 after his original owner passed away and his wife decided to move to a different home. She thought Ben would not be safe in the new neighborhood. 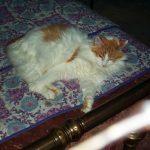 Ben was 21 years old when I had to have him put to sleep. He fought a courageous battle against Basel cell Carcinoma and old age. In his final two years, he was blind and could not hear very well. 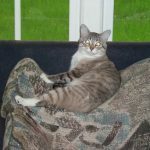 Nevertheless, he could still get around quite well and would always come to my lap when I was working at the computer or relaxing on the sofa. He would stretch up with his two front legs, rest them on mine, and then lift his back leg up and wait for a hand to give him a boost. I did everything for him I could, but it was not enough. I will miss you my friend. God speed Ben. 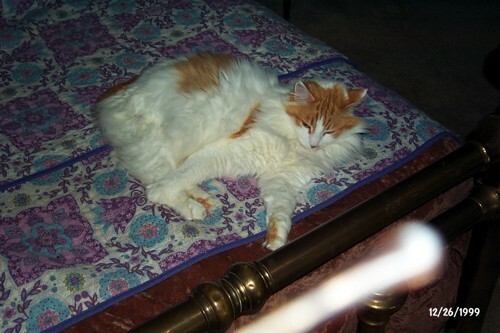 Samson was a great cat. I’ll never forget the day I saw him as a kitten screaming all get out from atop a tall, wooden fence next to a gas station I frequented in Charleston, SC. It was Thanksgiving Day – 1993, and I had stopped to put some gas in my truck before continuing to a friend’s home for dinner. I heard this little cat, seemingly lost or abandoned, meowing at the top of his lungs. I went over and took the cat off the top of the six foot high fence and placed him in my old pickup. I asked the attendant if he knew the owner of this fur ball, but he did not. So that little cat stayed in the truck all afternoon while I ate dinner and watched football with Marvin. You see, I lived a fair distance from my host, so I didn’t have time to take the cat home. The following day I placed notices up in the neighborhood, at the station and in the paper. No responses. That’s how Samson came to live with my mother, Louise. Samson lived with my mom and her cats and dogs until we moved to Raleigh in 1997. Zoe and Ben were my only charges. 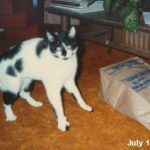 When my mother passed away in 1999 all the dogs and cats came together. It took a while for them all the get use to each other, but eventually they did. 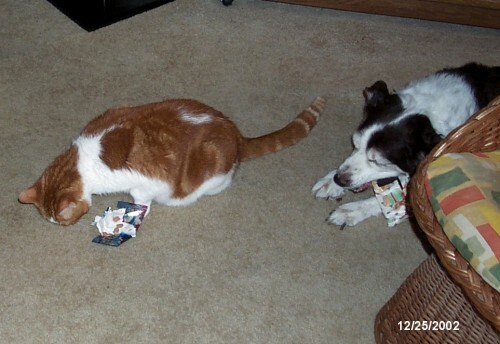 Photo three has Samson and Kiwi (11/30/89 – 4/5/03) opening their presents Christmas Day 2002, and photo five shows Samson on the sofa with Ben (foreground) and Suki (1985 – May 2002). Samson had a great personality. Sometimes I would watch him race around the back yard climbing a few feet up each tree as he passed. 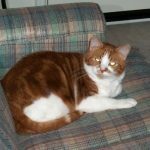 Toward the end of his life he curled up beside me when I was napping. Another interested aspect I thought a little unusual. 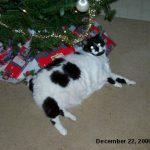 In the final year of his life he developed diabetes. I had to give him two shots a day – one in the morning and one in the evening. When it came time for his shots he would come right over, kneel down and wait for his shot. He never seemed to mind. A year into the shot regimen he was diagnosed with cancer. I did all I could do to save him, but it was too late. Six weeks after diagnosis he was gone. He was a wonderful asset to my life. I’ll miss him. God speed Samson. I mentioned Suki in Samson’s information. In April 1985, about a year after we moved to Johns Island, I was out on a ten mile run. 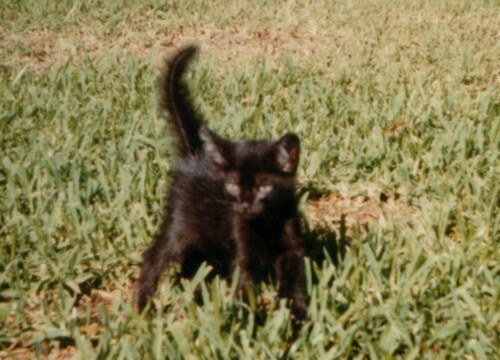 About two miles from the house I spotted this solid black kitten wandering on Main Road. He couldn’t have been more than a month old. There were no homes close by and no sign of other kittens or cats. So I picked him up and ran the two miles back to the house with this tiny cat clutched between my palms. I presented him to my mother who immediately took him in. 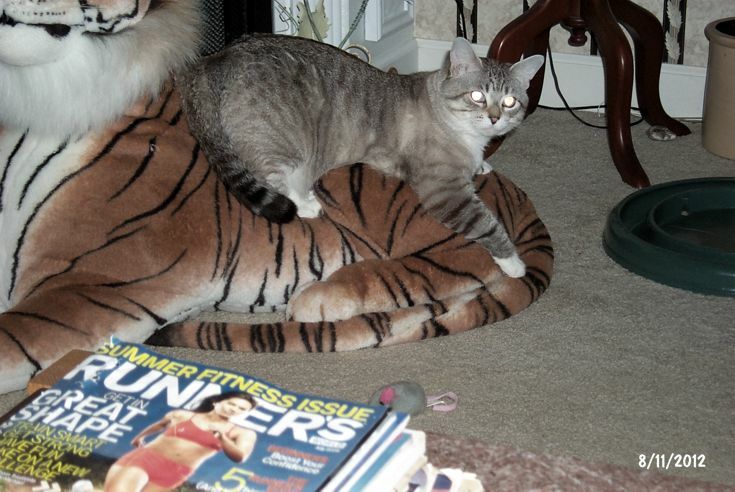 Suki was an indoor/outdoor cat who repeatedly managed to get in fights. I found him next to the house one day so torn up I thought he was dead. I placed him on a make shift litter and took him to the vet. He survived another close encounter. I believe he had more than the prerequisite nine lives. As he grew older he began to mellow. He was another fine companion. CCI took in some animals from a preserve that was forced to close. 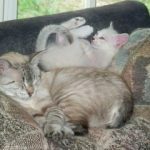 Two of the animals were Chausie cats – Pollyanna (Right) and Miss Betty (Left). Both cats were polydactyl. 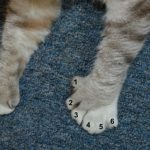 They each had six toes on their front paws. Here is how Wikipedia defines a Chausie. That was around 1999. I can’t recall precisely. These two cats were housed in an outdoor cage. 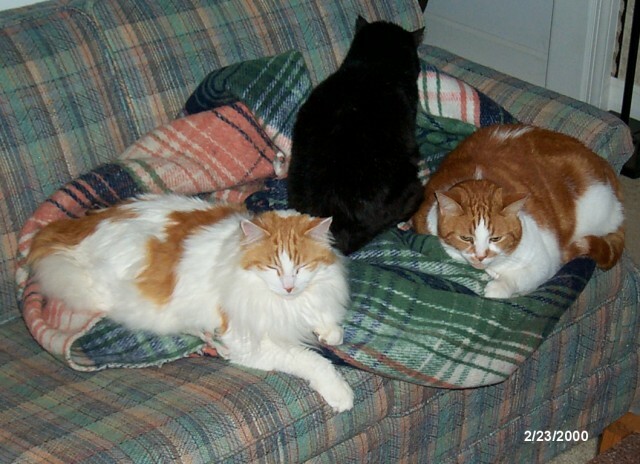 I was offered these cats, so I took them home. That was around 2002. Pollyanna and Miss Betty were breeding cats in the past. They were also litter mates. They were fun cats. They would chase each other up and down the stairs and all around the back yard. They got along well with my other cats. This is a strange story. I left the house to visit an old friend in Wilmington, NC on the morning of June 8, 2010 – my birthday. I said goodby to Miss Betty and Pollyanna. They both looked fine. I returned to Raleigh around 6 PM. I saw Pollyanna, but I could not find Miss Betty. I looked all over the place including the back yard where they played. I finally found here under a bed in the side bedroom. She had torn up the carpet to make what looked like a nest. 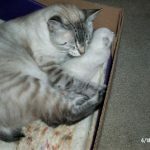 In that nest were two, tiny kittens. Upon closer investigation I saw that one of them was dead, its hind end missing. I theorized that Miss Betty had killed it due to some abnormality. The other kitten was alive. I was very worried about that kitten. 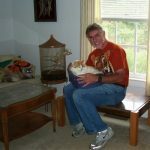 I knew I could not take the kitten and hand raise it, so I took it to my vet who was very close to the house and still open. The vet said they would take care of the kitten, but if they did they would have to assume ownership. I was willing to pay them to save the kitten, but they wanted to keep it. I didn’t want that, so I decided to get the necessary formula and hand feed it every two hours. 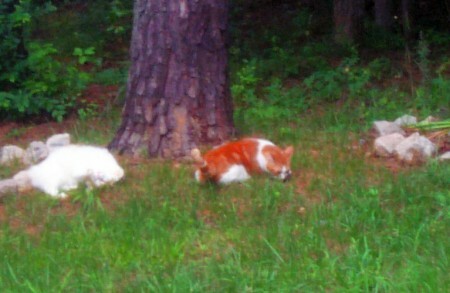 However, before I did that I would try to determine if Miss Betty would take care of her remaining kitten or kill it. I put her and the kitten in a towel lined box in the hall bathroom. I then observed them every hour for the next twenty-four. Nothing unusual happened. 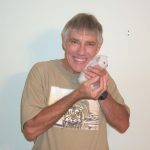 I determined that the kitten would be cared for and safe. I named the little cat Zeus. He is a male. Miss Betty’s pregnancy was, and still is, baffling. 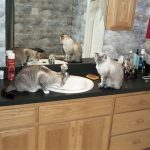 First, the two cats I now had were both females. Second, my back yard has cat fencing on top of the chain link. This keeps my cats in and others out. I’ve never had a cat escape or another cat get in. 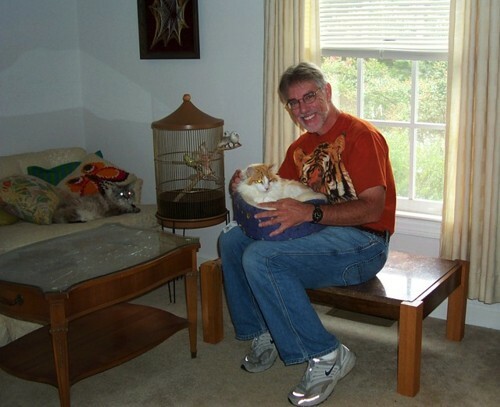 Furthermore, I had not seen any strange cats hanging around my house. For the most part, Zeus looks exactly like Miss Betty. He has no traits of my neighbor’s cats. Her pregnancy is still a mystery. Zeus got to know Pollyanna for a short while before she passed. Zeus is a great cat. 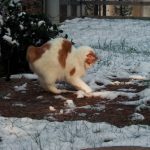 To this day (March 20, 2017) he has never set foot outside. I tried to take him out several times, and he almost clawed my arms off. I don’t understand his reluctance. He is very smart and playful. He is now my only cat. I have considered getting him a roommate, but I don’t want his personality to change. So I’m still considering that move. One other thing. Zeus is polydactyl just like his mom. There is a difference however. 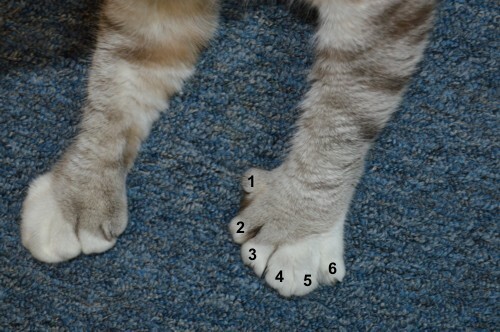 Zeus’ six toes are straight across the front of his paws. (12-11-97) Zoe and Ben are fine up here in North Carolina. We moved in July to help with the tiger program. They have a much bigger cat fenced yard, but Zoe rarely goes out. Ben is out all the time. They get along a little better. (02-19-01) Zoe and Ben are still hanging in there. Zoe still doesn’t go out much although she has a half acre of cat fenced area to roam. 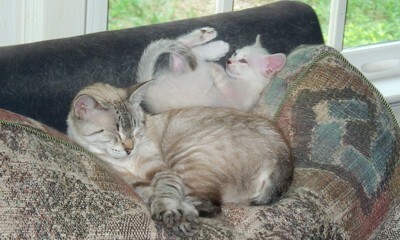 She gets along fairly well with Ben, but she still doesn’t like Samson, a male short hair. Maybe because he has a tail? (07-15-01) Zoe is fine after a tooth extraction several weeks ago. A tissue sample was also taken for cultivation and frozen storage at Lazeron. Ben and Samson are fine. 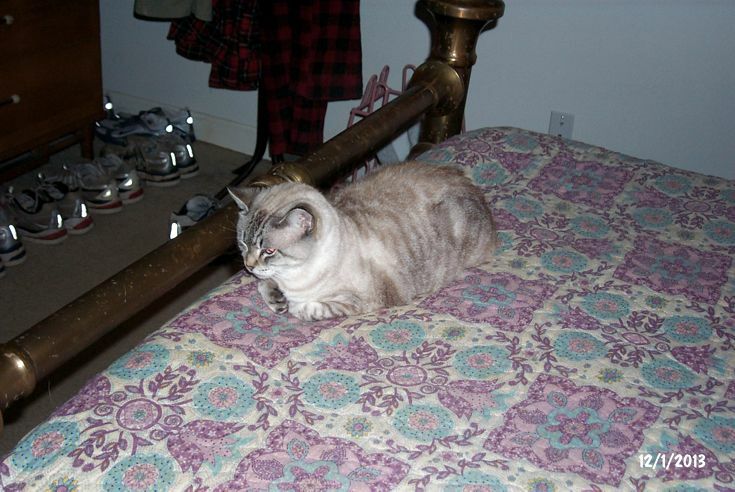 (March 17, 2000) Suki passed away. 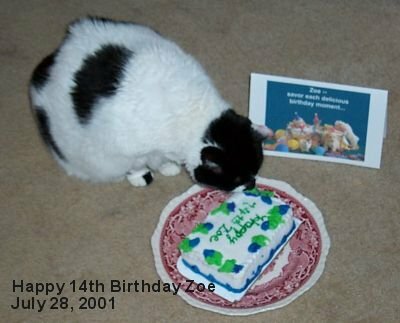 (May 2, 2002) Zoe passed away today. (October 10, 2003) Samson passed away today. (May 28, 2009) Ben has had quite a few problems in the past two years. 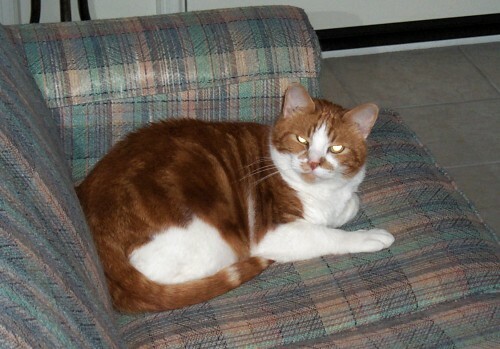 He is on medication for high blood pressure, which took his sight, and a thyroid issue. The vet thinks he has a form of cancer on his nose. From a practical standpoint it is untreatable due to his age and frailty. He also has a problem with a sack that developed off his colon. He now weighs about six pounds and holding. He’s hanging in there however. He’s now almost 21 years old. 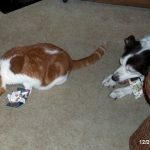 (December 19, 2009) Ben Passes. This was a very hard day. I knew for the past few days Ben’s time was drawing near. He fought a courageous battle against age and his Basel cell carcinoma. Yesterday he came forth with some forlorn vocalizations. He was not sleeping as most cats do most of the time. He was seeking me out and sitting in my lap whenever I was around, which was now most of the time. He was drinking a profuse amount of water, which seemed to go right through him. His temperature was also below normal. I had taken him to see the vet only a few days ago to get an antibiotic for an infection that was causing him to get blood in his urine. The shot seemed to clear that up, but there were too many other things going on. This morning he was restless. He was drinking a lot of water, but eating very little, as had been the case for the past few days. He was vocalizing more; seemingly trying to tell me it was his time. I never wanted him to suffer. To this point he was eating, drinking, getting around well, and in no pain. But he had lost two thirds of his body weight. I decided to have him put to sleep. I asked the vet about giving him something to calm him so the ride to the hospital would not be noticed. She gave me a valium mixture that she said would give him a kitty high that would be pleasant. Giving him that liquid was a mistake I’ll never forget. When I squirted the mixture in his mouth, he immediately fell to the floor. He tried to get up for his water, but could not stand. I held him up, but he could not drink. His head went limp in the small, red water bowl causing water to be inhaled. This was a disaster. The valium could not have taken that immediate type of effect. I didn’t know what to do. I took Ben with me to the couch and held him in my arms. I hated the way things went. He was having trouble standing. I hoped that was due to the valium taking effect, but I could not be sure. I placed him on his small blanket in his carrier and took him to the hospital, which was only a mile away. I said my good byes through tears. 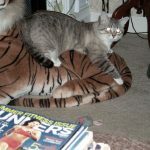 That was the last time I saw this wonderful cat – Ben. In retrospect, after digesting information I learned from the vet, I should have made a different decision. I did not want to see Ben die, but that would have been the best decision. I initially asked the vet if she could come to the house and administer a sedative to knock Ben out before administering the lethal drug. She said that all sedatives stung at the injection site, so you would probably see the animal hurting before the sedative took effect. This I did not want. That’s why I opted for the valium. I thought that would be an optimal solution, but the reaction I described was dreadful and will be hard to live with. 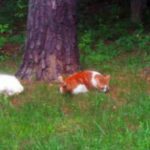 The vet said the barbiturate they use to put animals to sleep does not sting at the injection site, so the animal does not deal with a painful administration. Upon injection, the animal loses consciousness and drifts away. That is what I should have done. I should have asked the vet to administer the injection at the house; in Ben’s comfortable surroundings. I just didn’t want to see him die. That was selfish. I will regret my decision forever. I hope Ben can forgive me. (June 8, 2010) Zeus is born. 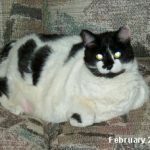 (December 21, 2010) Pollyanna passes away. She had severe kidney disease for which treatment failed. I had to have her euthanized. (January 27, 2014) Zeus and Miss Betty, his mother, are doing fine. Miss Betty is getting old. I’m not certain how old she is because she was a rescue from a preserve. She must be pushing fifteen or better. 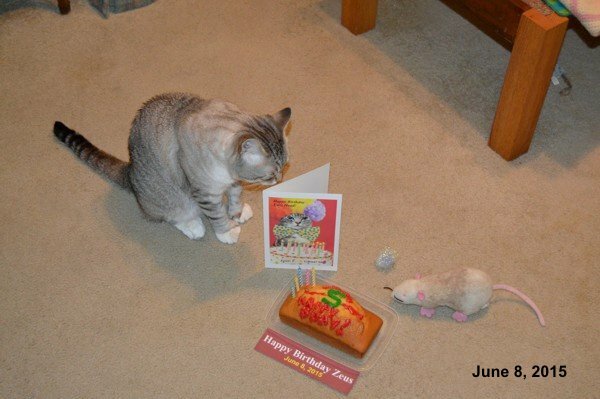 Zeus was born on my birthday – June 8 – in 2010. I can’t believe that in just a few months he will be four years old. Of course, I can’t believe how old I will be either, but that’s another story. 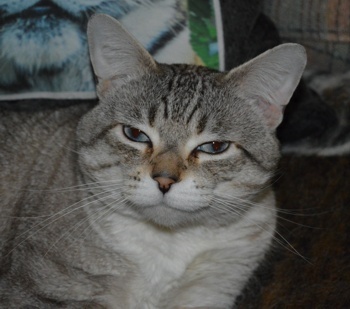 (September 11, 2015) Miss Betty passes away. She had cancer. I had the vet come to the house to euthanize her. She and Pollyanna were wonderful cats. Zeus misses his mom. (March 20, 2017) I am updating the Zoe Foundation website. 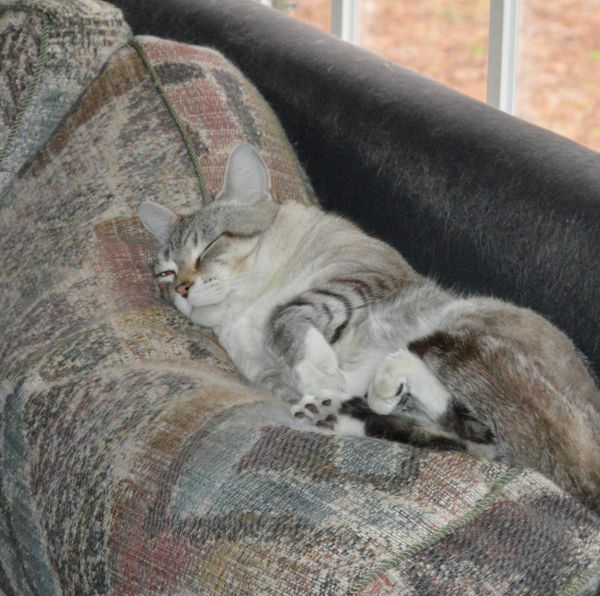 Zeus is still my only domestic, and he is doing fine. He has become a very vocal kitty. When he wants attention, he lets me know. 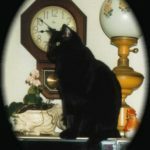 My vet did not do routine blood pressure checks beginning at age seven as recommended. 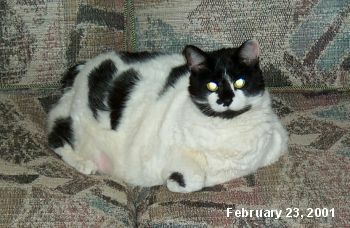 Please, if you own a cat(s) get their blood pressure checked. 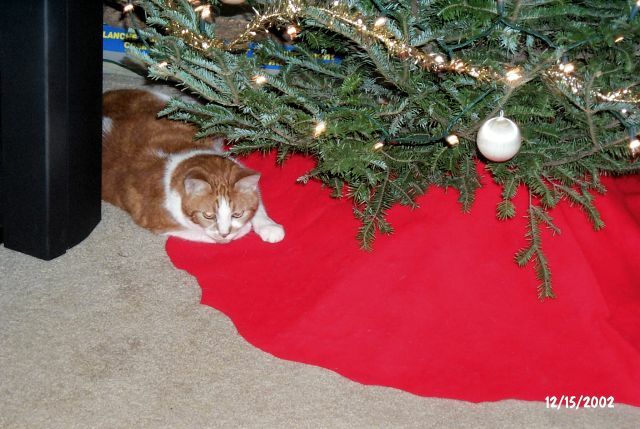 High blood pressure is the leading cause of blindness in cats.